There are forces all around us that would deter us from that effort. The world is constantly crowding in on us. From all sides we feel the pressure to soften our stance, to give in here a little and there a little. We must never lose sight of our objective. We must ever keep before us the goal which the Lord has set for us…. We must stand firm. We must hold back the world. If we do so, the Almighty will be our strength and our protector, our guide and our revelator. We shall have the comfort of knowing that we are doing what He would have us do. Others may not agree with us, but I am confident that they will respect us. We will not be left alone. There are many not of our faith but who feel as we do. They will support us. They will sustain us in our efforts. We cannot be arrogant. We cannot be self-righteous. The very situation in which the Lord has placed us requires that we be humble as the beneficiaries of His direction. When we teach, you and I must follow the revelations which God has given on Church doctrine. He may not have given revelations on atomic warfare, but he has given revelations on doctrine. Therefore, in our teaching, we are to follow the revealed word of God. We must be very wary of the teachings of men so that the wisdom and the teachings of men do not take us off on a tangent that will get us into difficulty. 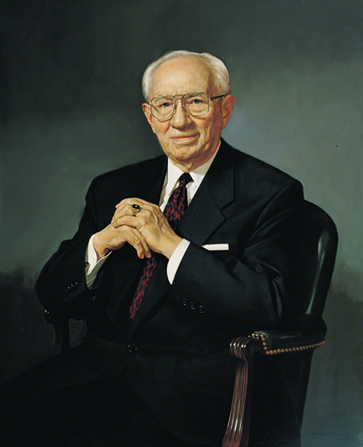 Based upon ancient and modern revelation, The Church of Jesus Christ of Latter-day Saints gladly teaches and declares the Christian doctrine that all men and women are brothers and sisters, not only by blood relationship from common mortal progenitors, but also as literal spirit children of an Eternal Father. The Hebrew prophets prepared the way for the coming of Jesus Christ, the promised Messiah, who should provide salvation for all mankind who believe in the gospel. Consistent with these truths, we believe that God has given and will give to all peoples sufficient knowledge to help them on their way to eternal salvation, either in this life or in the life to come.